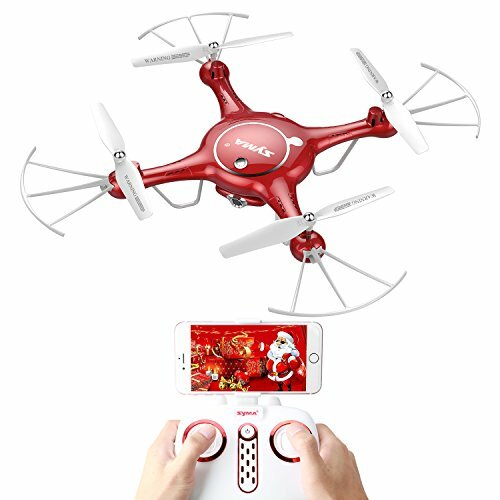 【APP CONTROL 】Unique remote control function of app, control the drone with the smart phone, enables the users to experience the new fun of flying. To fly your FPV RC drone even without the transmitter. 【HD Wifi Real-Time Transmission Aerial】Quadcopter equipped with 720P HD cameras, lets you control the aircraft enjoy taking pictures/video of the pleasure lights. 【FLIGHT PLAN】Open the "SYMA GO"app: Use flight plan at your fingertips. draw a route on the flight-track interface with your fingertips on the screen, the drone will fly in accordance with per given route. 【One Key Take-off and Landing】One key take-off/landing, Video/Photograph/Raise & Down/Forwards & Backwards/Left & Right Turning/Left & Right Flying/Hovering/360 Degree 3D Rotating, Colorful LED light for flying in the dark at night, continuous rolling,Flight Plan, App/Transmitter Control. 【Headless Mode】In headless state, no need to adjust the position of aircraft before flying, the operator just needs to control the aircraft in accordance with the direction of remote control's operating rod. It helps the beginner to get the hang of directional control within several minutes.